My Sister, the Serial Killer was not at all what I was expecting, and I loved it all the more for that reason. I think marketing this book as a thriller and comparing it to Dexter does both the book and the reader a disservice. Don’t get me wrong, Dexter is one of my favourite shows, but that is not what this is. There are thriller elements to it but the reader is pretty much in the know the entire time. The murders are a very small part of the story. 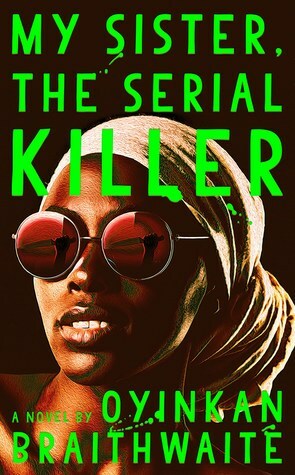 Korede was a much more interesting character, in my opinion, even though she herself is not the serial killer. The book raises an interesting question about morality and what we would do to protect the ones we love. Having the book told from Korede’s perspective was a brilliant choice and I appreciated being inside her head. I wish she would have made some different choices, but that is what makes this book so interesting. It is amazing, while also being completely frustrating. I love when a book can bring out such a mix of emotions in me. I also thought that the book touched on some interesting themes about society and the privileges afforded to attractive people who may not deserve them. I have seen some people say that they are tired of the trope of the unattractive character being jealous of their pretty sister, which is valid, but I thought it worked in this case. It almost felt satirical in many ways. I have come to the realization that this is the type of “thriller” that I enjoy. It is subtle and more character driven. It is not full of twist and turns, but it is an interesting character study. This is not a book that will be for every one, but at only 226 pages I truly think it is worth giving a shot. Yes, but do not be fooled by the marketing. Go in to this one knowing that it is nothing like Dexter. This is not your normal thriller full of twists and turns. It is more of a character study and a look at what people will do to protect the ones they love. Avengers Readathon TBR- My First Readathon! It’s one I look forward to reading. Everyone says it’s great, so I’m curious. I’ve never watched Dexter and haven’t been paying attention to the marketing, so that won’t affect me much. It is a good one. I think even people who don’t love thrillers will enjoy this one. It’s more literary than I was expecting and I loved it. Excellent review! I just read this one also. You’re correct: very interesting character study and relationship between these sisters! Thank you! Exactly. It’s much more than just a thriller. Great review! This keeps popping up on my Goodreads feed, and it sounds like a sharp take on the thriller novel. Exactly! It’s unlike any other thriller I have read. This sounds like a really interesting concept. I like the idea of the book exploring the morality of protecting the ones you love rather than focusing so much on the actual murders. Nice review! Thank you! I really think you’ll enjoy this one. I found it had a lot of depth! Great review! I totally agree that the marketing doesn’t do this book justice. There’s so much more going on beneath the surface. Thank you. That’s so accurate. So many more layers than I was expecting. This one is definitely on my to read list!! Thank you! It’s a good one for sure. This sounds like an incredibly interesting book and I have a fondness for books about sister relationships so I’ll have to give this one a go! It really is a great book. I don’t have a sister but can imagine that the relationship can some times be very complicated. This book does a good job showcasing that! I have heard wonderful things about this novel but I haven’t read it yet. I do plan to read it though- soon. I hope you enjoy it! It’s very original! Oh wow, I didn’t realize this book was so short! I don’t watch Dexter so that comparison didn’t make a difference to me anyway, but I love the idea of character-driven thrillers so that’s a good sign I’ll enjoy this one. I think you just might! It’s an interesting take on a thriller and I thought it was very well done. Great review! I’m so glad you enjoyed this one, it’s been one of my favorite reads of the year so far. I was also pleasantly surprised by the ways it did not quite fit its marketing, and I loved the commentary woven in. Such a compelling little book! Thank you. It’s such an original book so I guess I can see why it would be a difficult one to market!